Total Gym delivers a total body workout in just minutes a day. 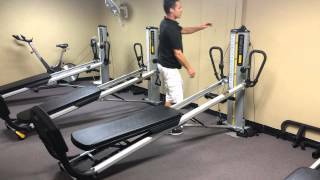 Cardio, strength training, stretch all on 1 machine. 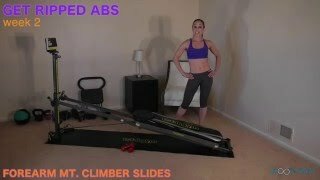 Allows you to engage, strengthen and tone all major muscle groups simultaneously. The traditional ab crunch on the floor is pretty challenging... a stiff floor can wreak havoc on your back. 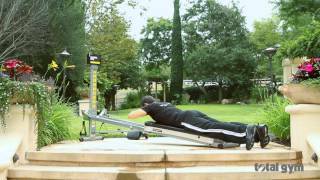 Total Gym's padded glide board makes it easy to complete a set of crunches. Plus, you can adjust the level to make it easier or harder depending on your fitness level. Unhook pulley cable and install squat stand. Place feet hip distance apart on the squat stand and bend knees slightly. 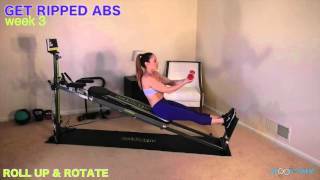 Contract abdominals and with hands crossed at your chest, lift your head and shoulders off glideboard. Hourglass figures here we come! This is a super effective move to slim and firm your middle in just weeks. This twisting movement also makes a great exercise for those everyday tasks like lifting and rotating at the same time... think putting away groceries! Twist to the top of your Total Gym and bring both handles together. Keeping your abs tight and both handles together, twist your torso towards the bottom of the Total Gym. Twist slowly back to the starting position, controlling your descent. So many of our customers aspire to improve their abs and shrink their waists, so we've developed some easy exercises that truly provide results! This assisted sit-up is the perfect way to widdle away your waist and burn loads of calories. Hook pulley cable and remove squat stand. Place your feet toward the top of the glideboard. Reach your arms forward. Slowly begin to lie back until you feel your shoulder blades come into contact with the board. As your waist shrinks and abs strengthen, you can move to more advanced exercises like this. You'll be surprised how quickly you get there. That beach body you've hoped for starts here with Total Gym home gym equipment! Put your feet into the wing or multifunction attachment at the top of your Total Gym. Lie upside down on the glideboard and fold your arms over your chest. Keeping your legs straight, bring your elbows to your thighs. 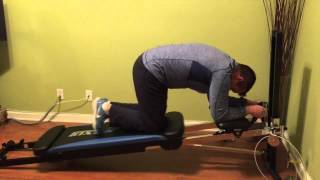 Lower your upper body back to lying position on the Total Gym glideboard.